Any of these trade secrets or currently developing invention ideas may be submitted in future patent applications. 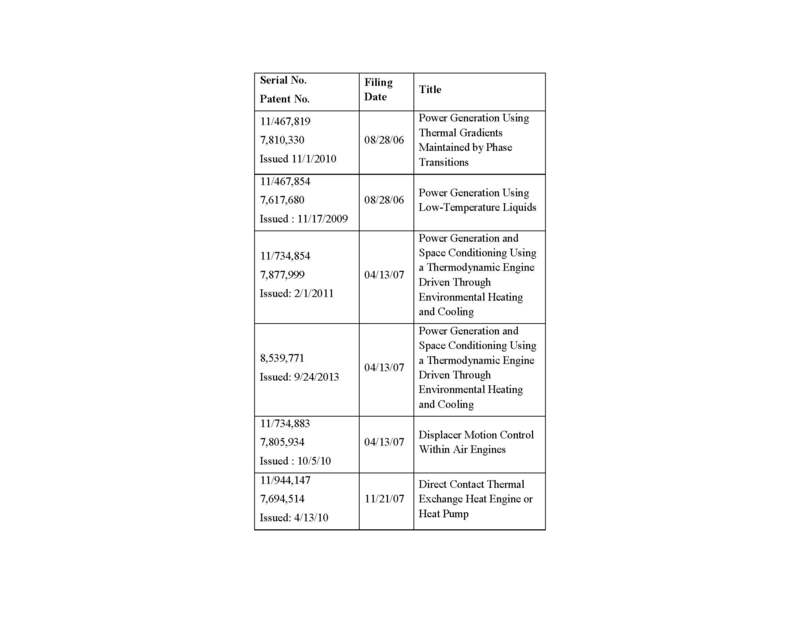 The intellectual property developed by Cool Energy, Inc. since its founding includes Stirling engine modeling software, Stirling heat pump modeling software, solar-Stirling system modeling software, and Stirling engine waste heat recovery modeling software. Other intellectual property developed by Cool Energy includes inventions for which Cool Energy has sought patent protection. 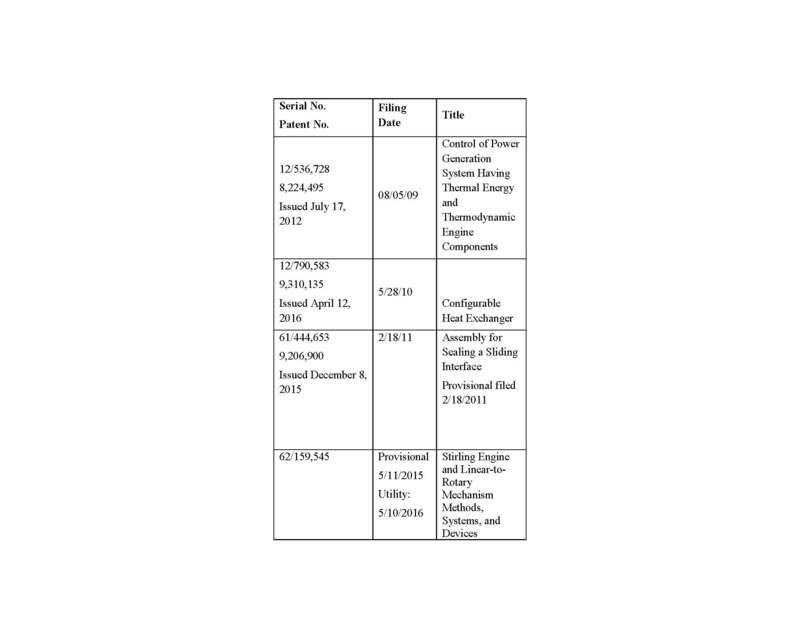 The following table lists all issued patents and patent applications currently in process by Cool Energy. 2. Design and fabrication of hybrid heat exchangers comprised of a pressure-sealing body and rolled heat-transfer fins. The body and fins have been configured with both similar and dissimilar materials. 3. Design and fabrication method for very high surface area heat exchangers using off-the-shelf components in a custom housing. 4. Multiple different mechanical crosshead designs to prevent side loading of the piston assemblies on the cylinders. 5. Techniques for controlling valves between the thermal cycles and the crankcase space for startup and shutdown of Stirling engines. 6. Stirling-engine-driven Stirling cooler configurations. 8. Methods for Stirling engine operation at cold side temperatures less than -100°C. 9. Best-in-the–world thermodynamic modeling tool for low to medium temperature Stirling engines. 10. Best-in-the-world dynamic mechanism modeling tools for balancing kinematic Stirling mechanisms, as well as maximizing time between service intervals.